In this volume of the Journal of Police Studies, authors reflect on the substance of theoretical developments concerning police. 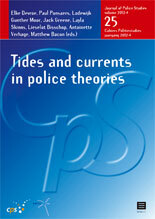 The different contributions discuss the article by Jack Green, called The Tides and Currents, Eddies and Whirlpools and Riptides of Modern Policing: Connecting Thoughts. The paper was the outcome of a seminar organized at Ghent University in the framework of the working group on policing of the European Society of Criminology (ESC), held in September 2010. The contribution of Greene is referring to original background papers which were published earlier. With this volume, we want to push the analysis further, starting from the observations Jack Greene makes in his provocative roundup.